Meet your greeter at Florence Train station in the early morning to get your train tickets and travel documents. Enjoy a leisurely train to Rome in 1.5 hours, where you will have time to enjoy the highlights of Rome onboard the hop on and off double decker bus. Buses depart from Rome Termini every 15 minutes. Great for art lovers, this comprehensive itinerary gives you special Skip-the-Line access to the art treasures of the Vatican. Your small group will spy precious antiquities in the Vatican Museums; you’ll also take in the jaw-dropping extravagance of St. Peter’s Basilica, and the most famous frescoes in the world inside Michelangelo’s Sistine Chapel. Guiding you will be an English-speaking art expert, whose knowledge illuminates the history behind these incomparable artworks. With a hop on and off full day pass you'll be able to see all the highlights in Rome from on board the double decker bus. You can jump off at any location and another bus will be by every 15 minutes. Plan to be at the Vatican Museums stop at either 11:15 a.m., 12:15 p.m., or 1:15 p.m., to take part in your Vatican Museums Tour. After meeting your guide near the entrance to the Vatican Museums—and skipping right past the long entry lines—you’ll walk through cavernous galleries filled with ancient sculptures, ornate tapestries, the beautifully preserved Gallery of Maps, and Etruscan antiquities. The most famous frescoes in the world will greet you when you enter the jewel box that is the Sistine Chapel. Here, you’ll be surrounded by the stunning Michelangelo masterpieces that have adorned a million picture postcards—including the nine central panels of the chapel ceiling, each depicting a tale from Genesis (the most famous being The Creation of Adam). Your tour’s final destination, St. Peter’s Basilica, is both one of the world’s largest churches, and one of its most sacred Catholic sites. The grand church building, with its soaring, statuary-topped travertine walls and parabolic dome, sits atop the very spot where St. Peter was buried. You’ll see the church’s baldacchino (a twining bronze canopy that shelters the papal altar); its chapels and elaborately painted, multi-domed ceiling; and, perhaps most stirring of all, Michelangelo’s remarkable Pietà—a sculptural depiction of the Virgin Mary cradling her dying son. Jump back on the hop on and off bus to return to Rome Termini for your trains departure at 6:50 p.m. returning you to Florence Santa Maria Novella station. Please note that photography is prohibited inside The Sistine Chapel. Non-flash photography is permitted on all other parts of the tour. 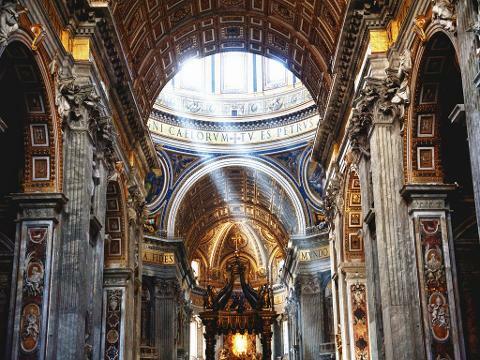 Please note that St. Peter's Basilica may experience last-minute closures for religious ceremonies. If this occurs, your group will instead be treated to an extended tour of the Vatican Museums. Tour refunds or discounts will not be provided. Clothing that covers your knees and shoulders. Entry into St. Peter’s Basilica requires adherence to these dress codes.